HAINAN ISLAND, China (AP) Gaby Lopez won her first LPGA Tour event with a 1-over 73 to finish one shot ahead of Ariya Jutanugarn in the Blue Bay tournament in China. Lopez is the first winner from Mexico since Lorena Ochoa, a driving force for the game in that Latin American country. "I mean, she's been my inspiration my entire life," Lopez said of Ochoa. "That's why I'm actually a professional golfer." 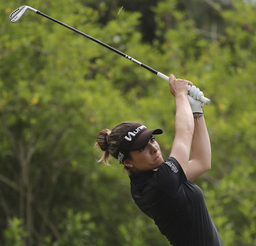 Ochoa was the LPGA's top-ranked golfer for several years until she retired in 2010. She won 27 LPGA Tour events. Lopez said she was also thinking of her grandfather, Jose Lopez, who died recently. "I always told him that I was going to give him my first trophy," Lopez said. "Sadly I didn't, but he was with me all week long and I couldn't be more lucky, more fortunate to have him still alive in me." Jutanugarn played the last two rounds with Lopez and was happy for her - even in defeat. "She did a great job last two days," Jutanugarn said, knowing Lopez was "nervous sometimes."